A while back I posted my academic research Capstone Project called Bai Fu Mei: An In Depth Look at the Chinese Quest for Lighter, Brighter and Whiter Skin. In my paper I discussed the difference between skin whitening and skin bleaching creams, how they actually whiten skin, why many Chinese women feel the need to be whiter, and it’s effects of society. I recently came across the article Lupita Nyong’o is Inspiring African Women to Stop Bleaching their Skin, and I thought it was a great compliment to my previous article. The article discusses the serious problems of unregulated skin whitening products on the African market, which is also a serious problem in Asia. While I didn’t dive into the black market products much in my essay, I did do a lot of research on these products. Most skin whitening products on the shelves of stores are expensive Western brands like Aveeno and Neutrogena; their products are more or less the same as our anti-aging spot creams, with different packaging. They even out skin tone and reduce the production of melanin which creates spots. These western products are safe to use daily as long as they are accompanied by SPF. Most Western countries only allow very small amounts of the whitening ingredient, hydroquinone, to be used in whitening creams. According to the above article, 2% is the maximum limit for over the counter creams in the US. Many countries in Asia have been experiencing problems with un-regulated black-market creams that have a larger percent of hydroquinone, which is either banned or strictly regulated in most countries. For example, in the US people with hyper pigmentation are prescribed higher-percentage hydroquinone creams to be used in a specific dosage for a short period of time. In China and many other countries in Asia, these black market creams are sold at a much lower cost than their Western equivalent and promise faster effects, but they are very dangerous. According to the article, hydroquinone is not regulated in many African countries, meaning these dangerous creams run rampant. While in Asia, most women only apply these creams to their face, neck and hands, African women are applying them all over the body, causing serious medical problems. Hydroquinone in excess is toxic to the skin and can lead to a blotchy uneven complexion, permanent darkening of the skin and even brain, gastrointestinal and kidney problems. It can also thin the skin, making it much harder for people to recover from surgery, and may even lead to severe infections or death (You Beauty). While I can’t necessarily relate to the desire to be any whiter than I already am, I try to use these stories and articles as inspiration to love the skin I was born with. Many of us with fair skin in America are constantly trying to make it darker; we bake under the sun or in UV booths or dye it with self tanner that is expensive and stains our clothes. These caucasian notions of beauty are deeply engrained in my culture. Come summertime, no one wants to be “pasty” white. I worry how my white legs will look in shorts, or if I will look fatter in my bikini without a tan. Yes, I am under the firm impression that a tan makes me look thinner. I am also very versed in the art of self tanner. I was a competitive ballroom dancer in college and I often joked that it was time to “dye myself a different race” before my ballroom competitions. 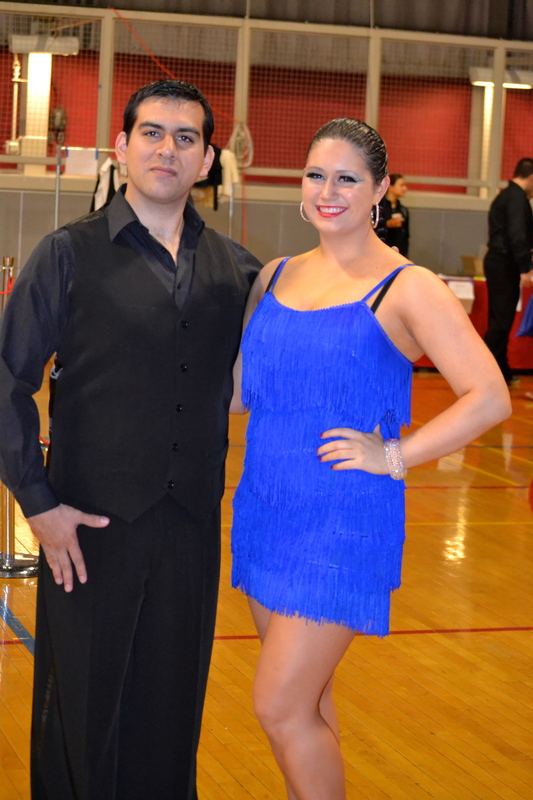 My Peruvian ballroom partner and I at our last competition. After spraying myself with an entire bottle of self tanner over the course of five days, we now have the same complexion! Living in China, I get so many compliments on my fair skin, and many women ask what creams I use to make my skin so fair and even. Umm… moisturizer mixed with a little liquid foundation? Removing myself from caucasian America’s tanning-obsessed culture has made me realize I need to re-evaluate my priorities and love the skin I’m in. Chinese people can’t seem to grasp that I don’t agree with their standards of beauty. Personally, when I see Chinese girls who avoid the sun all summer, I think they look a little sickly and Vitamin D deficient, but in China they’re the epitome of beauty. I’ve come to realize that people are most beautiful when they celebrate their natural skin tone. I’ve now decided that apart from ballroom competitions where a tan is a part of my “costume” (akin to fake eyelashes or a sparkly dress), I need to stop actively making myself tanner. If I get a tan this summer it will be from hiking outdoors or swimming in the ocean (with SPF of course!). Luckily, I am surrounded by tons of fair-skinned beauty role models like Anne Hathaway, Amanda Seyfried, Christina Hendricks, Nicole Kidman and Jessica Chastain; but many women of African and Asian descent aren’t so lucky. Hopefully Oscar-winning actress Lupita will be able to act as a positive role model and help many young women love the skin they’re in. This entry was posted in Uncategorized and tagged academic research paper, Africa, Asia, ballroom, ballroom dancing, beauty, black market, complexion, culture, dance, hydroquinone, Lupita, role model, self tanner, skin bleaching, skin whitening, spray tan, UV. Bookmark the permalink.